The deadline for applications is 15th of April 2019. 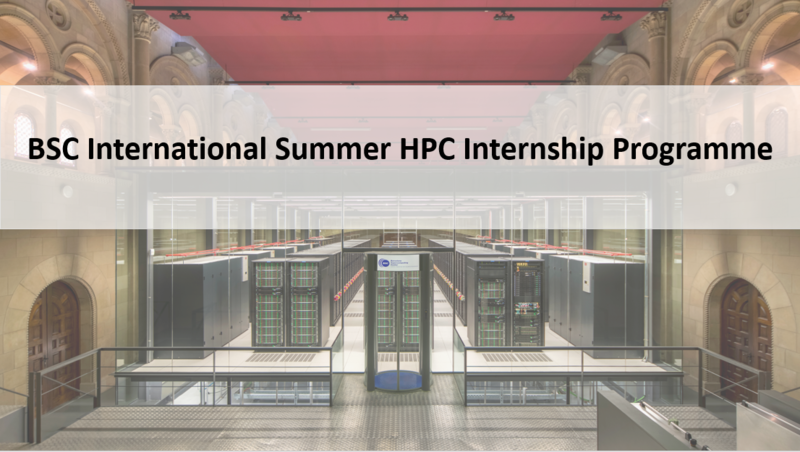 Barcelona Supercomputing Center (BSC) launches the 1st BSC International Summer HPC Internship Programme, which aims to encourage students, from any nationality, in the path of a scientific career and to introduce them to an HPC environment. For this first edition, BSC is looking for 8 to 16 outstanding undergraduate students in order to spend a maximum of 10 weeks within the summer period (from June to September) at BSC. The interns will carry out research in one of BSC’s departments (Computer Sciences, Computer Application in Science and Engineering, Earth Sciences and Life Sciences). The Severo Ochoa award funds this call. Undergraduates with an excellent academic record and a strong interest in BSC fields of research. One full year of university degree completed. Candidates may not have received an Undergraduate Degree at the time of the Internship. Highly motivated and willingness to work in an international multidisciplinary group. Availability to do a student agreement through your University.